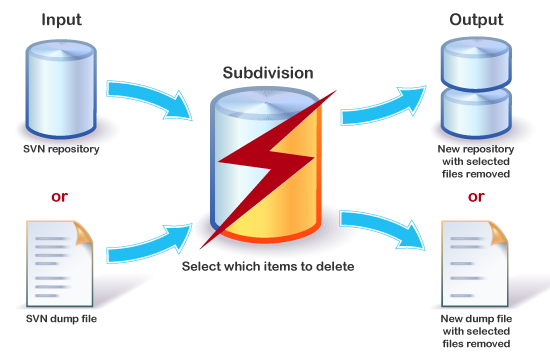 Subdivision can be used to delete (or obliterate) files and folders from an svn repository. Once the selected files have been chosen for deletion, Subdivision will produce a new repository minus the selected files, as though the files had never existed in the repository. This is very useful in the case where sensitive files have been accidentally committed to the repository and must be removed for business or legal reasons. Obviously a normal delete will not work since the files will remain in the svn history. The delete functionality is also very useful in the case where a repository accumulates a number of unnecessary or bulky files, making repository backups slow and costly. Subdivision can delete these old files saving you time and money. Using sophisticated algorithms that analyze the svn repository’s data structure, Subdivision will make sure that exactly what you want to delete will be deleted. 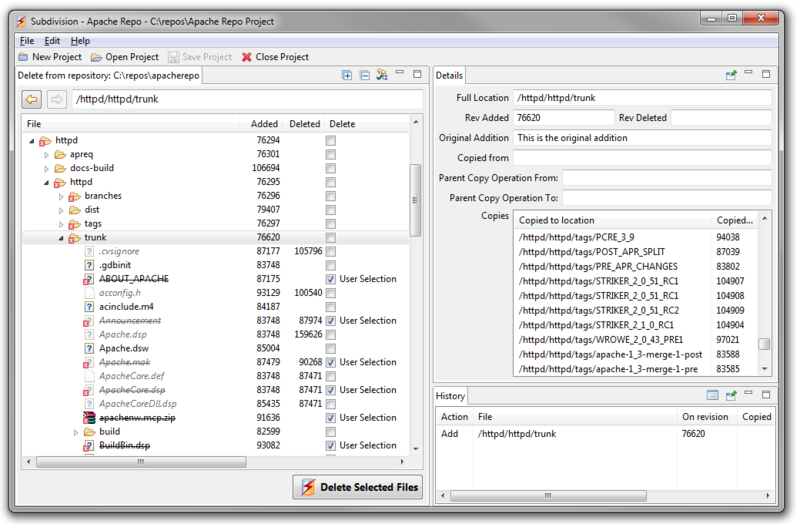 Subdivision will also calculate and show the user any additional files that will be deleted owing to their connection upon the files selected for deletion. Subdivision is flexible enough to work directly off the svn server files or from a dump file, and can generate either an svn repository or a dump files as output. And of course the operation is extremely safe as the original repository is never modified so it can be archived away once the administrator is happy with the output repository.